1851, 12¢ gray black, horizontal pair on part India paper, o.g., never hinged, huge margins showing seven adjoining stamps on three sides and sheet margin at left, deeply etched impressions on brilliant paper, exceptionally fresh and Superb pair; with 2018 P.F. and P.S.E. certificates, both Graded (Superb 100J). Scott No. 17 $17,500 as o.g. THE SMQ VALUE FOR A SINGLE GRADED 100J IS A STAGGERING $165,000, A PAIR IS UNPRICED. The postal Act of March 3, 1851, was to provide for relatively inexpensive postage and new graduated postal rates coupled with the issuance of new 1¢, 3¢, and 12¢ stamps. The new rates of July 1851 did not include a basic single rate that would require a 12¢ stamp. The prepaid letter rate of 3¢ per half ounce up to 3,000 miles, or 6¢ beyond, and 1¢ for printed circulars. As such, the 12¢ value could only prepay multiple rates such as four times the 3¢ letter rate for up to 3,000 miles, or double the 6¢ rate for over 3,000 miles. There were no 12¢ rates even in foreign mails. For a time, the stamps were cut in half and accepted as 6¢ on letters from California. 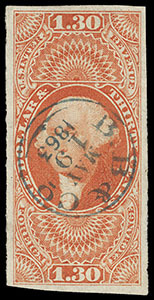 The only transatlantic postage rate listed in the 1851 Postal Guide that is a listed multiple of 12¢ is to Great Britain (24¢), which turns out to be the most common use of the stamp. Toppan, Carpenter, Casilear & Co. engraved the plates and printed the 1¢, 3¢ and 12¢ 1851 stamps in time for the July 1 issue date. While official government records reveal that the denominations were distributed to many post offices on or about July 1, 1851, the earliest confirmed usage of the 12¢ value is August 4, 1851. Moreover, while the Post Office had delivered over 230,000 stamps by June 30, 1852, there are only about a dozen uses documented for the entire last six months of 1851. 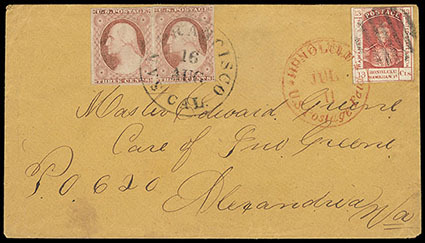 This is in contrast to the 1¢ and 3¢ stamps, for which numerous first day of issue covers are known to exist as well as hundreds or thousands of covers from 1851. The number of dated uses for the 12¢ stamps gradually increased in 1853 and beyond. Eventually, about 800,000 imperforate stamps were to be distributed. The imperforate 12¢ stamps were in use until mid-1857, when perforations were introduced. 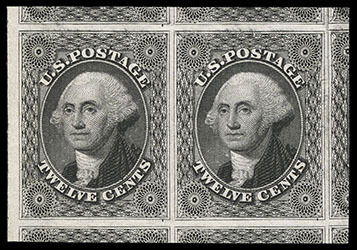 Plate 1 was used to print 12¢ stamps until Plate 3 was put into use in 1860, the latter only used for the perforate issue. I have received so many favors in the past that I only deserve a bit…I am begging your Holy Mercy, so that things of my service debt are so old, I have no other choice, but to relinquish although your Holy Mercy has here many servants and maids. Sir Martin de Ysasaga has been very unhappy on this island, and his business, we don't attribute to another thing because (of) his diligence and his friends guidance what he was owed never failed, but has caused what I said in these tempestuous times, until now and to this day are enduring without being fixed here or there. He was given his natives, as your holy grace would have known, sent with Juan Ciron, and may god help him as he has to this day, the Indian the king gave him never worked out, nor the remuneration of with he was never given another Indian…Pedro Moreno has the best scribe from the clerk's office by way of the Sir Secretary Conchillos, and at the beginning, when he first came here, your highness gave the secretary 100 Indians of which 100 were given to this Pedro Moreno on his name because that is what the statement said and he has them to this day without having secretary part of the 100 Indians. More say you should leave them because it serves the scribe and there are so few that can serve as scribe that with which only a name of a writer was paid in order to satisfy. On the other hand he had a secretary here on this island, 300 Indians by mercy of your holiness. After we have known that has been written here that has bestowed with 200 Indians of all that is here, and by not making a mental note of saying that those 100 of Pedro Moreno, if he has had them at this time. If your Holy Mercy would recollect about the senior secretary that you encharged gave to Ysasaga from this writing that made him give the 100 Indians and from this will make him very rich and he treats the secretary very badly, he doesn't share anything… Miguel Diaz has the power to stop (him from) doing it and none has left the stop. May your Holy Mercy send a good person that you buy and offer 300 or 400 pesos and 100 Indians that go with the official statement that will be here in 2 months after the arrival of the provisions, or after 6 months of holding the position in this city and I will be (leave as) creditor and that of a thing of such benefits and honor for him like this would be no lack of friends here that would help complete this… And because good from this gentleman to Ponce De Leon, but he ended up being removed and called to court emanate all from your hand, I don't want to distance myself from this case more, to only say to your holy grace that he will be able to rent the secretary this office for 70 or 80 persons each year, from only the documents, and moreover if this deal could be done. If this deal happens it will be a benefit, and if the 100 Indians that are offered with the position should be on top of what the person has, because otherwise it is giving nothing, because if you want to do well with him so much given to his person as he deserves. with some minor water staining hardly detracting, Very Fine. 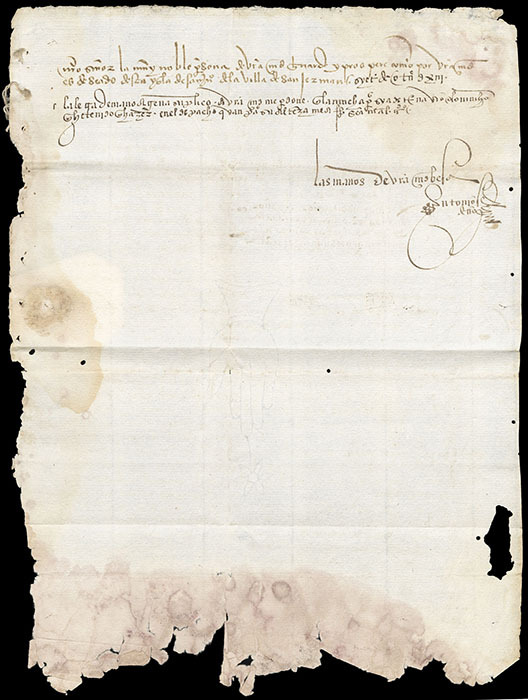 AN EXTRAORDINARY INTACT COVER AND LETTER WRITTEN DURING THE EARLY PERIOD OF PUERTO RICO'S COLONIZATION - BELIEVED TO THE THIRD EARLIEST INTACT COVER AND LETTER WRITTEN FROM THE NEW WORLD WRITTEN TWENTY ONE YEARS AFTER IT'S DISCOVERY BY CHRISTOPHER COLUMBUS. 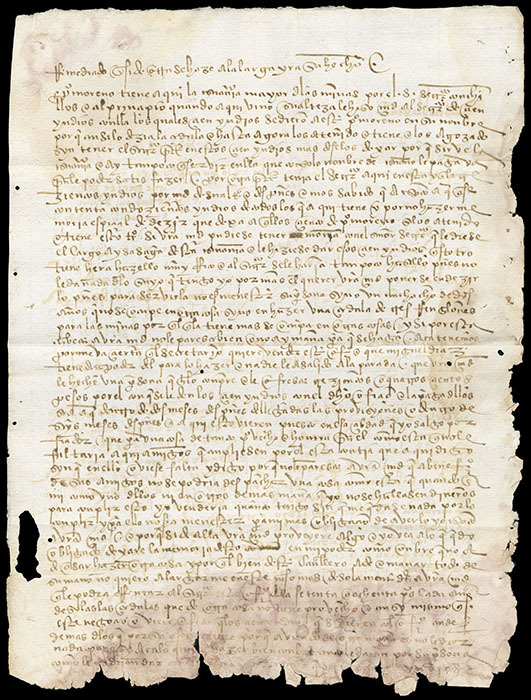 The author of the letter Antonio Sedeño (died 1538) was a Spanish conquistador and the governor of Trinidad between 1530 and 1538. Before his appointment to his position in Trinidad, Sedeño had been the Royal Treasurer of Puerto Rico. He obtained a letters patent from the King appointing him as the Captain and Governor-General of Trinidad on July 12, 1530. 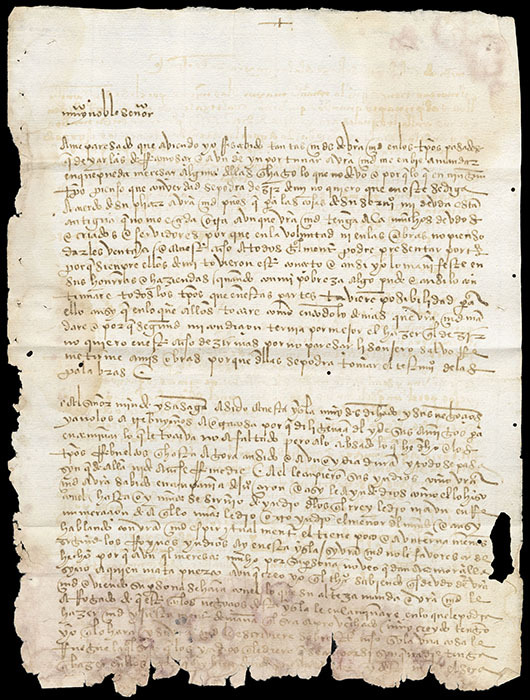 Mention within the letter, Juan Cerón was a Spanish Conquistador and the second and fourth governor (1509-1513) of Puerto Rico when the island was still called San Juan. As governor of Hispaniola in 1509, he dispatched Cerón to Puerto Rico with the title of Alcalde Mayor to replace Juan Ponce de León.Ponce de León had just begun the conquest of Puerto Rico the previous year, and his replacement produced much dissension among the few settlers. 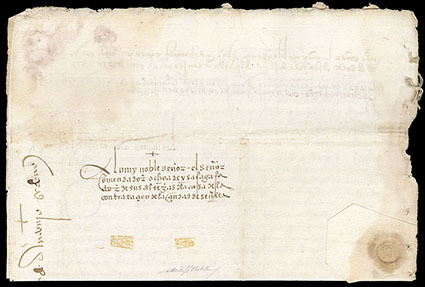 In 1511, under pressure by Colón, Cerón was posted as governor and Ponce de León left for his first adventure in Florida. Hawaii, 1893, 6¢ green, black overprint, block of 4, large part o.g., rich bold color, very fresh, few reinforced perfs, Fine, ex-Tows and Ishikawa; with 2012 P.F. certificate. 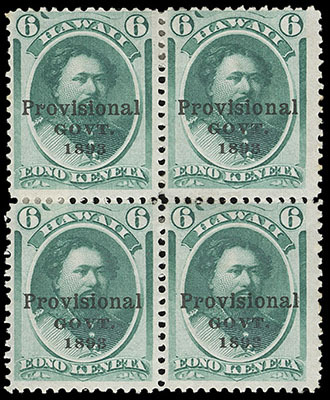 ONE OF ONLY TWO RECORDED BLOCKS OF FOUR OF THE 1893 6¢ PROVISIONAL GOVERNMENT ERROR OVERPRINT. 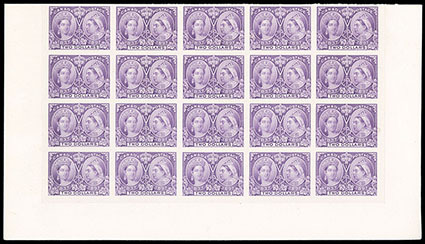 Sold in 1979 for over $80,000, this block was from the only sheet of 50 of these stamps ever produced. The sheet was purchased by the Honolulu Postmaster General Jos. M. Oat. Six of the known examples are used and a number of mint examples were destroyed in the 1906 San Francisco earthquake. This lot includes a photocopy of a 1904 letter from J. H. Makins to Percy T. Morgan regarding the purchase of these errors and a photocopy of a Makin & Co. letterhead affidavit from Postmaster General Oat guaranteeing that only one sheet was produced. 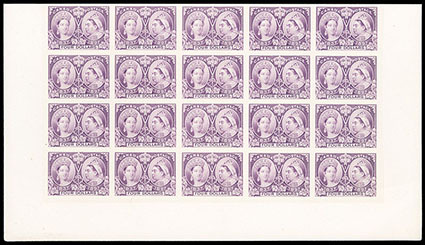 Canada, 1897, Queen Victoria Jubilee, $2-$5 issues, plate proofs, India on card, bottom sheet margin panes of 20, rich vibrant colors, Extremely Fine, rare in large multiple format, with only 650 to 800 of each printed. Scott No. 62P-65P. Unitrade No. 62P-65P C$64,000 ($48,190). AN EXTREMELY RARE DOLLAR VALUE SET OF THE $2-$5 JUBILEE ISSUE IN PANES OF 20. 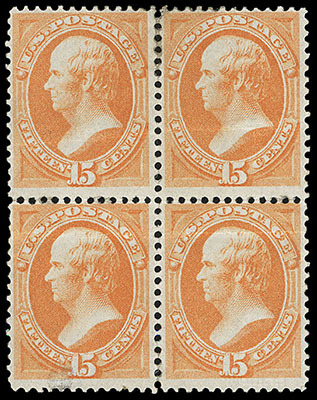 1870, 15¢ orange, I. grill, block of 4, large part o.g., strong bright color and crisp impression, horizontal crease through each stamp and bottom left stamp with a filled thin, F.-V.F. appearance, a great Banknote grill rarity, with block of four listed but unpriced in Scott; with 2018 P.F. certificate. Scott No. 141A $66,000 for singles. 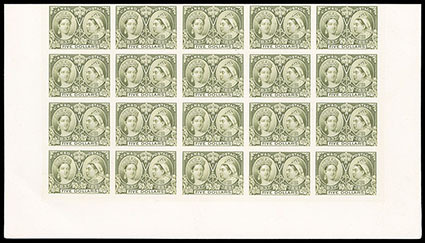 THE UNIQUE MINT BLOCK OF FOUR OF THE 1870 15¢ NATIONAL BANKNOTE I GRILL ISSUE. Starting with the 2013 Scott U.S. 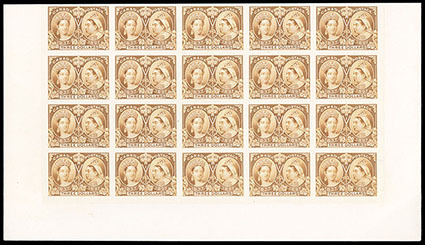 Specialized Catalogue, the 1870 Issue "I" Grills were elevated to major catalogue number status. The "I" grills are far scarcer than the regular "H" grills, and collector demand has proved this to be true. 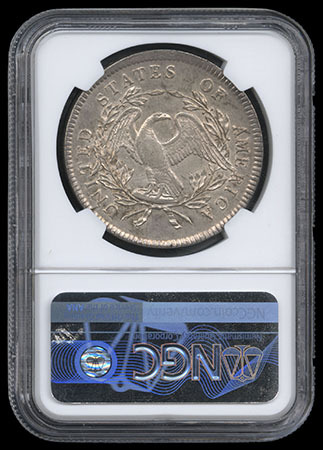 Examples for every value up to the 90¢ have been certified, with the high value exceptionally rare. There are only seven unused examples of the 15¢ "I" grill recorded, including this unique block of four. 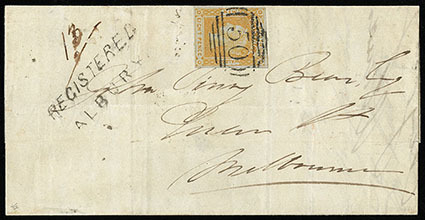 New South Wales, 1853, Queen Victoria, 8d orange yellow, medium bluish paper, rich deep color and large margins showing small portion of adjacent stamp at top, tied by neat barred "50" oval handstamp of Albury on folded letter sheet to Melbourne paying the 2d inter-Colonial rate plus 6d registry fee, with matching straight line "Registered, Albury" handstamp alongside, reverse with rimless oval "Albury, Sr 9, 1854" origin and "Melbourne, Se 11, 1854" receiving date stamps; light vertical file folds well away from stamp, Extremely Fine; with 1983 and 2017 R.P.S.L. certificates. Scott No. 20 var. SG No. 80 Estimate $15,000 - 20,000. A SPECTACULAR SOLO USAGE OF THE 1853 8D LAUREATE ISSUE. THIS IS BY FAR THE FINEST CONDITION COVER BEARING ANY 8D LAUREATES AND ESPECIALLY DESIRABLE AS REGISTERED MAIL. This cover sold in the 1984 Corinphila sale (sale 70) fetching 23,000SF. 1795 Flowing Hair Dollar. 3 leaves beneath each wing. 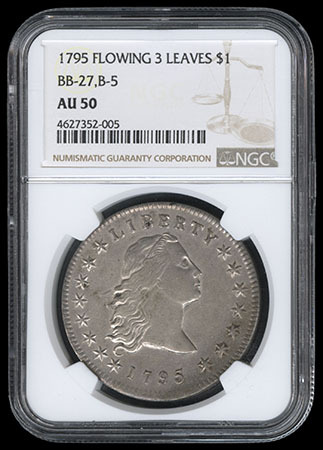 NGC graded AU-50. 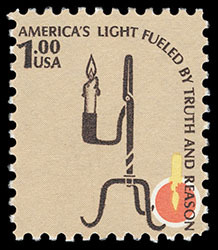 1979, $1 Lamp, brown (candle flame) inverted, o.g., never hinged, fresh and well centered, Extremely Fine and choice, rare with only about 95 examples accounted for from the only known pane issued. Known as the "CIA" invert, the known pane of 100 was sold by the McLean, Virginia post office in the spring of 1986 to an employee of the CIA who had been sent to the post office to buy stamps for the agency. The inverted error was discovered shortly thereafter and nine CIA employees decided to switch the errors for newly purchased normal issues. The story of what happened was eventually leaked and a scandal ensued with four employees being fired. Revenue, 1863, First Issue, $1.30 Foreign Exchange, imperf, socked-on-the-nose blue "B.B. & Co., May 19, 1863" circular date stamp cancel, mostly large margins, strong brilliant color enhancing a sharp detailed impression on bright fresh paper, Extremely Fine, ex-Joyce. A WONDERFUL SOUND EXAMPLE OF THE RARE 1863, $1.30 FOREIGN EXCHANGE IMPERFORATE BEARING A COLOR HANDSTAMP CANCELLATION.